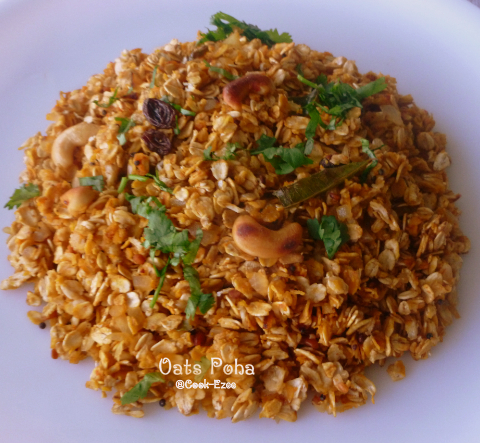 Oats and Poha?? I know I had the same feeling when my husband asked me to make Oats Poha couple of months back. One of his colleague brings oats Poha at work and that is when he asked me to try making Poha. Men are men, I was sure he will not check with his colleague for the recipe and yea I was right when he gave me a weird look when I asked him to do so ha ha ha :) But at the end when I started making it this way and it was well enjoyed by all my husband said he is gonna patent it in his name since the great idea was him. wow, what an idea sirji, dimaakh jiska patent uska? he he..
We are so familiar with Oats Porridge, dosa, Oats mixed roti's, cookies etc and oats freaks like me and my husband can eat anything with oats. 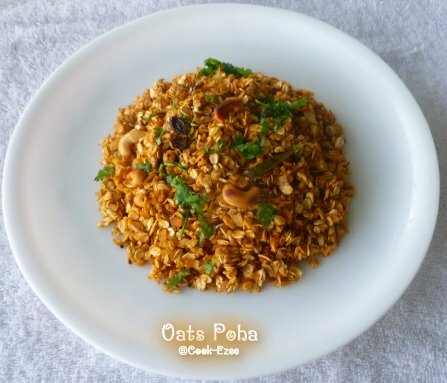 I was so confused about making Oats Poha as you know normally Poha is dry and non-sticky where as when oats combines with even little bit of water becomes very sticky and mushy. I gave it a lot of try and at the end I started making it with out adding any water and sautéing it by sprinkling water little by little till Oats leave its raw flavour. I must say this recipe comes with a lot of trial and errors but all the trials were worth trying it. This has become our family favorite dinner from quite a while especially on those days when we do not want to have any heavy dinner. So try it friends especially those who like oats or try this for the elderly people at home who are regular in having oats at night. Lets give them a break from the same porridge, I'm sure all will enjoy this. Heat a non-stick pan and pour the oil to oil. Add mustard, when they start crackle reduce the heat to medium and add urad dal, chana dal, curry leaves and stir. Add cashews and rasins ad saute for few more secs. Add chopped onion, ginger, green chilly and saute well till golden color(light brown color only). Add finely chopped tomato as well and saute well till tomato's blend well with onion. Add turmeric powder and stir for few secs. Add oats and stir well and mix with onion-tomato mix. When the mix becomes very dry sprinkle a handful of water and stir well again. Check for the salt and sprinkle little more salt if the oats have not absorbed salt taste . Keep stirring and sprinkling water 3-4 times till oats leaves it raw smell and absorbs the taste of the seasoning. At the end add lemon juice and stir well to mix. Switch off the flame and move to a serving dish. I received this Liebster Blog award from Julie @ Erivum Puliyum. Thank you so much Julie for this wonderful Award!! 'Liebster' means favourite or dearest in German. So this award is to honor your dear blogger friends. 1. Thank the person that gave the award and link back to their blog. 3. Reveal the 5 blogs you have chosen to award and let them know by commenting on their blog. 4. Hope they pass it forward by accepting and awarding it to blogger they would like to honour. 5. Thank all those you read your blog and follow you. I would like to pass it over to the following wonderful blogger friends of mine. Please visit their site too and appreciate them in their venture of cooking..
Congrats Prathiba, keep up the good work. I'm really delighted to receive this Award from You.Thanks for selecting me Dear.Happy if U change my blog title by adding 'My Kitchen Favors - BonAppetit! 'Will be posting this with other Awards next week.Thanks Again. 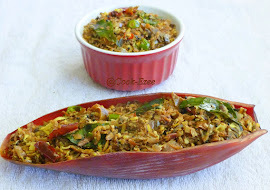 Oats Upma sounds cool and delicious. Nice Idea for perfect breakfast. Congrats on your award too. Keep going!!! Very innovative poha and quite a healthy one too,Pratibha!! Congrats on the awards too..wish you many more!! I am very happyyyy to receive the award and thanks for selecting me,will post it soon. it looks very inviting dear,would love to give this a go,a healthy one indeed. Congrats for the award and thanks for passing it to me. what a healthy dish, looks delicious, i love oats and bookmarking this :)..do drop at my space too..
Congrats on your awards n wish you many many more to come! 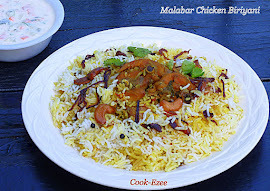 Healthy n yummy recipe, sounds very delicious.